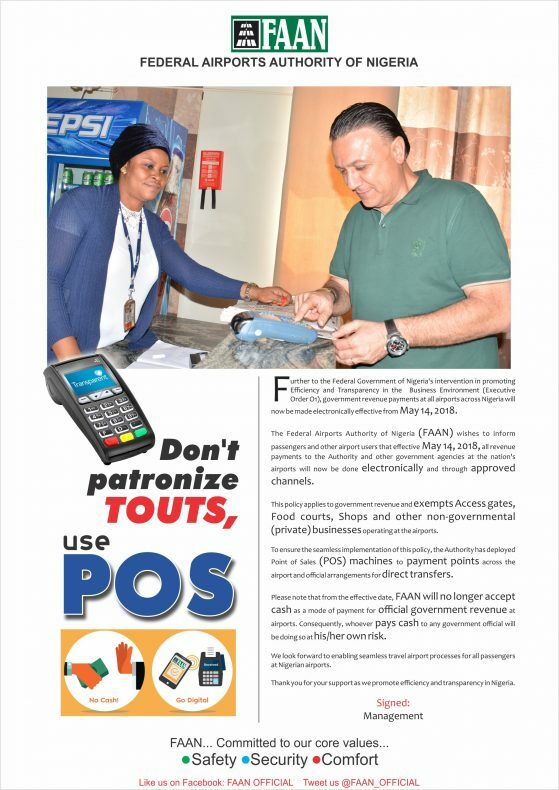 The Managing Director of the Federal Airports Authority of Nigeria (FAAN), Engr. Saleh Dunoma, has expressed delight with the level of work at the new international terminal at the Aminu Kano International Airport, Kano. He made this remark on September 21, 2015 when he paid a working visit to the airport to supervise the on-going construction of the new international terminal. One of the five being done simultaneously across the country. Engr Dunoma, while on this follow-up to the Permanent Secretary’s earlier working tour to the airport, noted that this laudable project was undertaken to increase the capacity of the affected airports while positioning them to be able to deliver efficient services at world-class standards, in order to maintain best practices as prescribed by the International Civil Aviation Organization, ICAO. Meanwhile, the FAAN boss has also said that new terminals at Nigeria’s major international airports in Lagos, Abuja, Kano, Port-Harcourt and Enugu will make Nigeria the hub of aviation in Africa, when they are completed in 2016. Dunoma, had made this known at Panama, during the Annual General Assembly Conference and Exhibition of the Airport Council International (ACI). Speaking as a panelist at the event, Eng Dunoma said the completion of these terminals would stimulate robust traffic growth in passenger and cargo traffic. 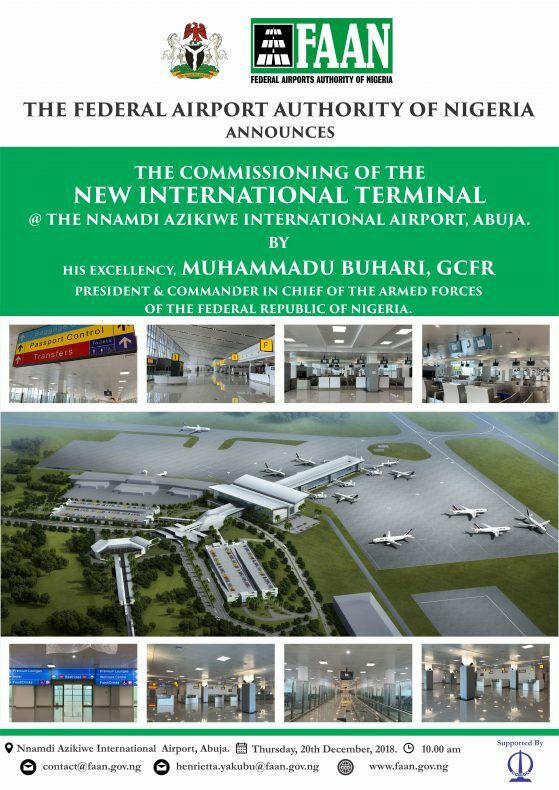 “These airports will improve passenger comfort, increase capacity and improve facilitation”, he said. He added that though the 7.2% increase for passenger traffic from the MINT countries (Mexico, Indonesia, Nigeria and Turkey) as contained in the 2014 ACI World Airport Traffic Report, was commendable, this figure would experience a steady rise. Earlier during the opening ceremony, the President of Panama, Mr. Juan Carlos Varela Rodriguez welcomed members to the city, highlighting the importance of aviation which contributes significantly to Panama’s Gross Domestic Product. In his welcome address, Joseph Fidanque III, the General Manager, Tacuma International Airport, said the Tacuma Airport was building a new terminal to accommodate growing traffic as the hub of region. Also speaking on the theme ‘Airports: Shaping our future’ the Chair of ACI World, Hector Navarrette said ACI “works across all aspects of the airport business, from our top priorities of safety and security to customer service, training, the environment, knowledge sharing and much more”. In her presentation, Director General of ACI World, Angela Gittens said ACI was enjoying more collaboration than ever with ICAO to ensure that policy decisions were balanced among airports, airlines and air navigation service providers. The Airports Council International (ACI) accounts for 590 regular members operating 1,850 airports in 77 countries. It promotes the advancement of the collective interests of the world’s airports and the community they serve; promoting professional excellence in airport management and operations worldwide. It would be recalled that the Federal Government has embarked on an ambitious project of constructing five new international terminals at the nation’s five international airports including Lagos, Abuja, Kano, Port Harcourt and Enugu.